Parcel Labels- Campbell International Specialist Tapes. Campbell International offers a wide range of parcel labels, these include "caution, heavy package" labels, red on white and white on red labels. Please note if you require quantities greater than 20 units we can offer substantial discounts, just contact us. We also offer custom/bespoke labels if you require something outside of our current range, whatever your labelling needs, we will provide a high-quality product at an unbeatable price. Colour/Symbol: 2 PERSON LIFT with warning symbol - black and yellow on white. Technical Specification: Labels manufactured from high quality paper with a permanent adhesive. Labels are supplied on a paper backing for easy removal. Dimensions: 148 x 50mm each label. Quantity: 500 labels/reel..
Colour/Symbol: BOX _ OF _ - red on white. Technical Specification: Labels manufactured from high quality paper with a permanent adhesive. Labels are supplied on a paper backing for easy removal. Dimensions: 89 x 32mm each label. Quantity: 500 labels/reel. 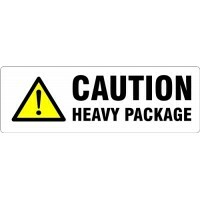 ..
Colour/Symbol: CAUTION HEAVY PACKAGE with warning symbol - black and yellow on white. Technical Specification: Labels manufactured from high quality paper with a permanent adhesive. Labels are supplied on a paper backing for easy removal. Dimensions: 148 x 50mm each label. Quantity: 500 lab..
Colour/Symbol: CAUTION HEAVY PACKAGE __KG with warning symbol - black and yellow on white. Technical Specification: Labels manufactured from high quality paper with a permanent adhesive. Labels are supplied on a paper backing for easy removal. Please note this product is not RoHS (Res..
Colour/Symbol: CONTAINS MIXED GOODS - white on red. Technical Specification: Labels manufactured from high quality paper with a permanent adhesive. Labels are supplied on a paper backing for easy removal. Dimensions: 89 x 32mm each label. Quantity: 1000 labels/reel. ..
Colour/Symbol: DO NOT BEND - white on red. Technical Specification: Labels manufactured from high quality paper with a permanent adhesive. Labels are supplied on a paper backing for easy removal. Dimensions: 89 x 32mm each label. Quantity: 1000 labels/reel. ..
Colour/Symbol: DO NOT CRUSH - red on white. Technical Specification: Labels manufactured from high quality paper with a permanent adhesive. Labels are supplied on a paper backing for easy removal. Dimensions: 148 x 50mm each label. Quantity: 500 labels/reel. ..
Colour/Symbol: DO NOT LIFT MANUALLY with warning symbol - black and yellow on white. Technical Specification: Labels manufactured from high quality paper with a permanent adhesive. Labels are supplied on a paper backing for easy removal. Dimensions: 148 x 50mm each label. Quantity: 500 labe..
Colour/Symbol: DO NOT OPEN WITH KNIFE with symbol - red on white. Technical Specification: Labels manufactured from high quality paper with a permanent adhesive. Labels are supplied on a paper backing for easy removal. Dimensions: 108 x 79mm each label. Quantity: 500 labels/reel. ..
Colour/Symbol: DO NOT SPLIT - red on white. Technical Specification: Labels manufactured from high quality paper with a permanent adhesive. Labels are supplied on a paper backing for easy removal. Dimensions: 108 x 79mm each label. Quantity: 500 labels/reel. ..
Colour/Symbol: DO NOT STACK - red on white. Technical Specification: Labels manufactured from high quality paper with a permanent adhesive. Labels are supplied on a paper backing for easy removal. Dimensions: 108 x 79mm each label. Quantity: 500 labels/reel. ..
Colour/Symbol: DOCUMENTS ENCLOSED - white on red. Technical Specification: Labels manufactured from high quality paper with a permanent adhesive. Labels are supplied on a paper backing for easy removal. Dimensions: 89 x 32mm each label. Quantity: 1000 labels/reel. ..
Colour/Symbol: FORKS MUST GO BETWEEN THESE POINTS - red on white. Technical Specification: Labels manufactured from high quality paper with a permanent adhesive. Labels are supplied on a paper backing for easy removal. Dimensions: 108 x 79mm each label. Quantity: 500 labels/reel. ..
Colour/Symbol: FRAGILE - red on white. Technical Specification: Labels manufactured from high quality paper with a permanent adhesive. Labels are supplied on a paper backing for easy removal. Dimensions: 148 x 50mm each label. Quantity: 500 labels/reel. ..
Colour/Symbol: FRAGILE - white on red. Technical Specification: Labels manufactured from high quality paper with a permanent adhesive. Labels are supplied on a paper backing for easy removal. Dimensions: 89 x 32mm each label. Quantity: 1000 labels/reel. 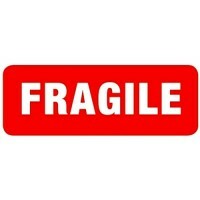 ..
Colour/Symbol: FRAGILE with logo - red on white. Technical Specification: Labels manufactured from high quality paper with a permanent adhesive. Labels are supplied on a paper backing for easy removal. Dimensions: 108 x 79mm each label. Quantity: 500 labels/reel. 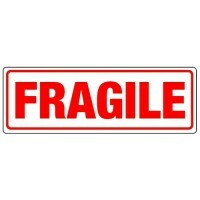 ..
Colour/Symbol: FRAGILE with symbol - red on white. Technical Specification: Labels manufactured from high quality paper with a permanent adhesive. Labels are supplied on a paper backing for easy removal. Dimensions: 150 x 100mm each label. Quantity: 500 labels/reel. ..
Colour/Symbol: GLASS - white on red. Technical Specification: Labels manufactured from high quality paper with a permanent adhesive. Labels are supplied on a paper backing for easy removal. Dimensions: 89 x 32mm each label. Quantity: 1000 labels/reel. ..
Colour/Symbol: GLASS WITH CARE - red on white. Technical Specification: Labels manufactured from high quality paper with a permanent adhesive. Labels are supplied on a paper backing for easy removal. Dimensions: 148 X 50mm each label. Quantity: 500 labels/reel. ..
Colour/Symbol: HANDLE WITH CARE - LIQUID - white on red. Technical Specification: Labels manufactured from high quality paper with a permanent adhesive. Labels are supplied on a paper backing for easy removal. Dimensions: 89 x 32mm each label. Quantity: 1000 labels/reel. ..
Colour/Symbol: HANDLE WITH CARE with logo - red on white. Technical Specification: Labels manufactured from high quality paper with a permanent adhesive. Labels are supplied on a paper backing for easy removal. Dimensions: 108 x 79mm each label. Quantity: 500 labels/reel. ..
Colour/Symbol: HANDLE WITH CARE - white on red. Technical Specification: Labels manufactured from high quality paper with a permanent adhesive. Labels are supplied on a paper backing for easy removal. Dimensions: 89 x 32mm each label. Quantity: 1000 labels/reel. ..
Colour/Symbol: HANLE WITH CARE - red on white. Technical Specification: Labels manufactured from high quality paper with a permanent adhesive. Labels are supplied on a paper backing for easy removal. Dimensions: 148 x 50mm each label. Quantity: 500 labels/reel. ..
Colour/Symbol: HEAVY GOODS with warning symbol - black and yellow on white. Technical Specification: Labels manufactured from high quality paper with a permanent adhesive. Labels are supplied on a paper backing for easy removal. Dimensions: 148 x 50mm each label. Quantity: 500 labels/reel. ..
Colour/Symbol: MAX WEIGHT 20KG with warning symbol - black and yellow on white. Technical Specification: Labels manufactured from high quality paper with a permanent adhesive. Labels are supplied on a paper backing for easy removal. Dimensions: 148 x 50mm each label. Quantity: 500 labels/re..
Colour/Symbol: MAX WEIGHT 25KG with warning symbol - black and yellow on white. Technical Specification: Labels manufactured from high quality paper with a permanent adhesive. Labels are supplied on a paper backing for easy removal. Dimensions: 148 x 50mm each label. Quantity: 500 labels/re..
Colour/Symbol: MAX WEIGHT 30KG with warning symbol - black and yellow on white. Technical Specification: Labels manufactured from high quality paper with a permanent adhesive. Labels are supplied on a paper backing for easy removal. Dimensions: 148 x 50mm each label. Quantity: 500 labels/re..
Colour/Symbol: MEDICAL EQUIPMENT HANDLE WITH CARE - red on white. Technical Specification: Labels manufactured from high quality paper with a permanent adhesive. Labels are supplied on a paper backing for easy removal. Dimensions: 148 x 50mm each label. Quantity: 500 labels/reel. ..
Colour/Symbol: _ OF _ - red on white. Technical Specification: Labels manufactured from high quality paper with a permanent adhesive. Labels are supplied on a paper backing for easy removal. Dimensions: 108 x 79mm each label. Quantity: 500 labels/reel. ..
Colour/Symbol: OPEN OTHER END - white on red. Technical Specification: Labels manufactured from high quality paper with a permanent adhesive. Labels are supplied on a paper backing for easy removal. Dimensions: 89 x 32mm each label. Quantity: 1000 labels/reel. ..